We perform written certified (authenticated) translations, providing high quality translation, timely execution of orders, absolute confidentiality of documents and competitive prices. An order for the translation can be submitted by e-mail, by an online form or by telephone. After receiving your text for translation we will determine the timing and the cost of the order. We provide a free estimate based on the source texts sent by a customer. As soon as the customer accepts the offer and places an order, we proceed to the execution of the task. The priority of the work of our office are the highest quality translations performed by professional translators for our customers. Very often, our customers need certified translations that are required in offices, by their employers or doctors. We translate regular and specialized texts, among which we can distinguish such areas as: medicine, law, engineering, IT, biology, chemistry, pharmacy, etc. How to order a certified (sworn) translation? For a quick calculation of the cost of translation you can obtain with no obligation a free valuation of the translation. Documents for a free quotation may be sent by completing the free quotation form. In response we will determine the timing and the cost of the order. For larger orders we always offer discounts. send us your text to get a free quotation with no obligation. Your personal details provided in this form are used only to contact you to arrange the order and will not be disclosed to third parties. A certified (sworn) translation is a translation which is performed only by a certified translator whose surname is on the list of translators of the Ministry of Justice. Such a translation is always stamped with the translator’s round stamp, which contains the name of a sworn translator and, in the middle, the language the translator uses as well as the translator’s ID number on the list of sworn translators. We translate contracts and declarations, school certificates, diplomas, certificates, notarial deeds, powers of attorney, authorizations and other documents. Sworn translations, i.e. 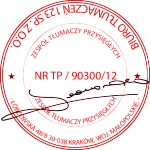 certified translations performed by translators with relevant powers of the Minister of Justice regulated by the Law on the profession of a sworn translator of 25 November 2004, which took effect on 27 January 2005. A standard page of a certified (sworn) translation includes, in accordance with the Regulation of the Minister of Justice, 1125 characters, including spaces. The texts are priced individually, depending on the language, the type of the text, its volume and the delivery time. We always try to meet all expectations of our customers, but there are several languages in which we cannot provide a certified translation. We cannot offer sworn translations in such languages as Estonian, Irish, Kazakh and Icelandic. In all other cases we can provide you with an authenticated translation. How to receive an original copy of the translation? We can offer you two choices of receipt of the translation: 1. In person in our office 2. By courier or by post. Feel free to contact us via our website, by telephone or in person in our office. All contact details can be found in Contact. Courier mail: You can also send your documents to translate by courier mail or by post and receive the translation by the same method. This way you will not have to come to our agency. By visiting our translation agency. Texts to be translated by a sworn translator should be provided in the original. If a copy or a scan is provided for translation, the translator is obliged to indicate that he translated from a copy.